The AGM will be followed by a General Meeting - All welcome. Welcome to the website for the Lake Conjola District which is located just north of the townships of Milton-Ulladulla and Mollymook on the NSW South Coast, Australia. 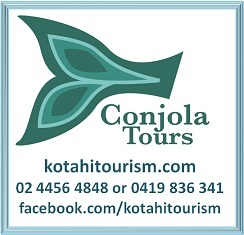 Conjola is a natural paradise with 660 hectares of pristine lake surrounded by the Conjola National Park, beautiful unspoiled beaches and four small villages around the shores of the lake - Lake Conjola, Conjola Park, Fisherman's Paradise, and Cunjurong Point. This perfect environment is the ideal location for water sports, bush or beach walking, mountain biking, or to simply relax and revitalise in the various accommodation facilities.